Saint Moses (Putilov) was born on January 15, 1782 in the city of Borisogleb in the Yaroslavl province, and was baptized with the name Timothy. His siblings were called Jonah, Basil, Cyril, Anysia, and Alexander. John Putilov named all his children after the saint commemorated on the eighth day after their birth, so the future Saint Moses was named for the holy Apostle Timothy of the Seventy (January 22). The children were educated at home, since their parents feared they would be corrupted in some way if they were sent away to school. When Timothy was nineteen, his father sent him and his younger brother Jonah to work in Moscow. While in Moscow they met the Elders Alexander and Philaret of the Novospassky Monastery, who had spiritual ties to Saint Paisius Velichkovsky (November 15). Through their aquaintance with these two ascetics of piety, the brothers decided that they also wished to become monks. 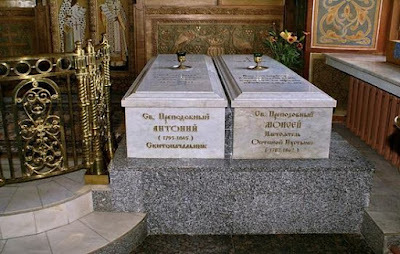 In May of 1805 they visited the Sarov monastery (which their widowed brother-in-law Cosmas Krundishev had entered in November 1804) and spoke with Saint Seraphim (January 2). The brothers remained at Sarov for two and a half years. At first they were assigned to the bakery, and then to other obediences. In 1811, following the advice of Hieromonk Alexis of Moscow’s Simonov Monastery, Timothy went to live with the hermits of the Roslavl forests. 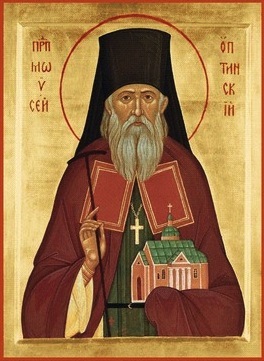 There he was placed under the guidance of Elder Athanasius, a disciple of Saint Paisius Velichkovsky. In time, he received the monastic tonsure from Father Athanasius and was named Moses. His sponsor at his tonsure was Elder Dositheus, who had lived in the Rostov forests for forty years. Alexander, the youngest brother of Father Moses, came to the Roslavl forest on January 15, 1816 to share the life of the monks. Four years later, he was tonsured with the name Anthony. He was placed in the care of Father Moses, to whom he remained obedient for the rest of his life. 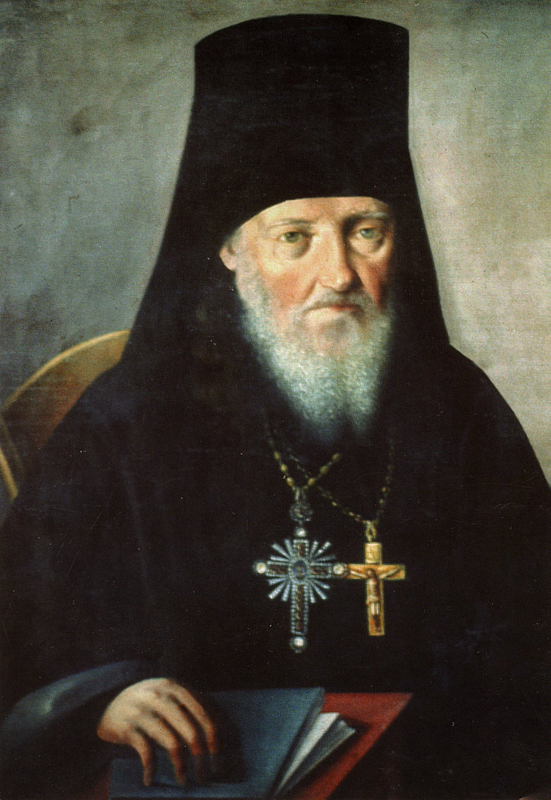 In 1821 Bishop Philaret of Kaluga (later Metropolitan of Kiev) suggested that the Putilov brothers move to the Optina Hermitage with a few monks and establish a skete near the monastery, where they could live in greater solitude. Saints Moses and Anthony arrived at Optina on July 6, 1822 to begin their labors. Their first task was to clear away some trees from the place they had chosen, and to uproot the stumps. They built a small cell and enclosed it with a fence, and also built a church dedicated to Saint John the Baptist. 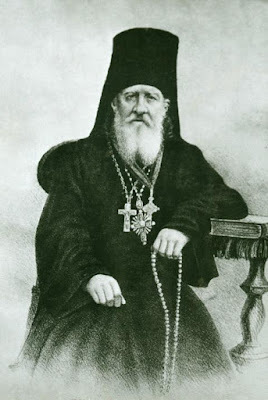 Bishop Philaret suggested that Father Moses be ordained, but he absolutely refused to consider it. The bishop said, “If you do not agree to this, I will call you to account for it at the Dread Judgment of the Lord.” Only then would Father Mose consent. He was ordained as a deacon on December 22, 1822, and to the holy priesthood on December 25. At the same time, he was appointed Father Confessor for the whole monastery. Father Moses was chosen to be the Superior of Optina Hermitage in 1826 when he was forty-three, serving in this capacity for thirty-seven years. He was prepared for this service by his years of living in the wilderness under the guidance of his Elder, and by his study of patristic writings. He was mature in years, and he had also acquired a spiritual maturity through his patient endurance of tribulations and acceptance of God’s will in all things. Optina underwent many changes during this time, and the number of monks increased. The size of the monastery’s property was doubled, orchards of fruit trees and berry bushes were planted, a library was established, and many buildings were constructed, including a cathedral and two churches. During a time of famine there was scarcely enough food to feed the monks. It was just then that Father Moses began the construction of guest houses on the monastery grounds and hired people from the neighboring towns and villages to do the work. The monastery not only paid their wages, but also fed their families. One of the monks was concerned that the coming famine would force them to postpone the construction and lay off the workers. Saint Moses told him that the people would not starve, because as long as God sent gifts to the monastery they would share them with the people. Though he was short-tempered by nature, Saint Moses struggled to acquire patience and meekness. If he felt himself becoming angry, he would leave to pray by himself for a while. Once he had calmed down, he would return. He would also advise people to keep the rule of Saint Dorotheus (June 5) for being at peace: “Do not desire that things turn out the way you would like, but desire whatever happens. That way you will be at peace” (Seventeenth Instruction). Saint Moses did not sleep much. He would arise before midnight, and usually came to church for Matins. He said that the Bloodless Sacrifice was offered for us at Liturgy, and so the monk should sacrifice his own rest at Matins. During Father Moses’ time the monastery published sixteen volumes of patristic writings under the direction of Saint Macarius (September 7). Saint Moses would send these books free of charge to various monasteries and individuals for their spiritual benefit. Although Saint Moses concerned himself with every aspect of the monastery’s life, his greatest achievement was to establish eldership at Optina. He received Saint Leonid (October 11) and Saint Macarius into the monastery, yet he submitted his will to them. He made no decisions, and would not tonsure any monk without first seeking their counsel. Saint Moses had the gift of eldership himself, but preferred not to offer spiritual counsel to the brethren. He left this to Father Leonid or Father Macarius. On June 15, 1862 Father Archimandrite Moses became very weak, and had to be supported by others when he received Holy Communion because he did not wish to partake of the Holy Mysteries of Christ while lying down. That evening he listened as the Gospel according to Saint John was being read for him. At midnight he received Holy Communion again, although this time he received lying down. A few hours later, Saint Moses raised his right hand and those in the room came to receive his blessing. He continued to bless, even when there was no one there. Evidently, he was blessing people he knew in other places. Later the monastery received a letter from a person in Saint Petersburg who said that he had seen Saint Moses in a dream at the very hour when he was dying and blessing those who were absent. He seemed to see the Elder lying on a bed and blessing each individual member of this person’s family. Then it was decided to resume reading the Gospel over Father Moses. The monks took turns reading until about ten o’clock when the Elder breathed a little sigh and surrendered his soul to God. At that very moment, the monk who was reading reached the end of the sixtenth chapter of the Gospel of Saint Matthew: “For the Son of man shall come in the glory of his Father with his angels; and then he shall reward every man according to his works. Truly I say unto you, there are some standing here who shall not taste of death until they see the Son of man coming in his kingdom.” (Matthew 16:27-28). Several years after his death, the holy relics of Saint Moses were found to be incorrupt. - Should you exercise mercy toward another, you will receive mercy for it. Should you pray, even a little, from the heart for salvation, you will be saved. Should you accuse and condemn yourself before God for the sins on your conscience, you will be justified for doing so. Should you be sorrowful over your sins, or be moved, or shed a tear, or sigh, your sighing will not be hidden from Him. St. Simeon tells us,“Nothing is hidden from Thee, my God, my Creator, my Redeemer, neither a teardrop, nor a part of a drop.” St. John Chrysostom states, “If you only lament over your sins, He will take it as a reason for your salvation.” Each day examine yourself: What have you sown for the age to come: wheat or weeds? Having tested yourself, arrange to become better the next day, and spend the rest of your life in that manner. In the event that you spent today badly, did not honestly pray to God, did not feel even once contrition in your heart, did not become humble in thought, gave no alms and did no act of charity, but instead did not refrain from anger, from words, from food and drink, or if you sank your mind in unclean thoughts, honestly examine all of this, condemn yourself for it, and firmly resolve that tomorrow you will be more careful to do good and to avoid evil. - You must bear the spiritual infirmities of your brother gladly, and without annoyance. For when someone is physically ill, we are not only not annoyed with him, but we are exemplary in our care of him; we should also set an example in cases of spiritual illness.